ahhh this book was brilliant! 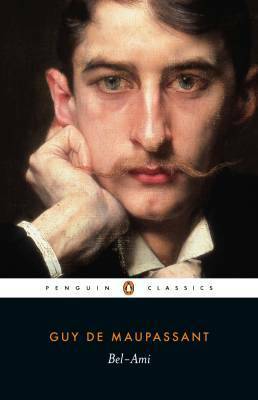 I borrowed the Penguin classic edition which was translated from French. I’ve read Les Miserables – Victor Hugo in the Penguin classic edition which was translated from French and that had some major typos. Thankfully this one didn’t! Then again this one was only just over 400 pages long, the translator working on Les Mis probably got bored after page 400. It’s a solid novel. I only picked this up on a whim from my library and I found it quick to get through! Duroy is quite the manipulative character. The writing is in 3rd person and I still felt swept up. I really enjoyed the insight we have into his relationships and how he gets these women to go out with him! First he starts sleeping with a woman who is already married. Then he proposes to another woman a very short time after her husband dies and marries her because she has a ton of money and writes his articles for him. Then he gets jealous because she’s better than him and purposely shags a woman in their home because he knows they’ll be caught! The other side of the novel shows Duroy’s rise in the journalism industry. The thing those women have in common is that their husbands are incredibly influential and he wants in on it. It’s a really great novel. I’m not gonna lie though, I didn’t find it friggin amazing/life changing. Maybe if I knew a lot about the history of how France was in that time period, then maybe I would! If classics or french literature aren’t usually your thing I’d still recommend this! Previous Previous post: Love, Rosie: Part 2. The Review. Next Next post: Ice Cream Book Tag!